Digital marketing services continue to evolve at a rapid pace. Content marketing, social media, search engine optimization, analytics, and other online activities are vastly different today than they were just a few years ago. Deciding how to prioritize, budget, and implement your digital marketing efforts can create many challenges. Nearly 75% of marketers said their organization on average commits over one-third of their marketing budget to digital marketing. Eighty percent of respondents reported year-over-year growth in the percentage of their marketing budget allocated to digital efforts. However, over 50% of these marketers indicated budget overruns were their most significant challenge. Respondents allocate 53% of their digital budgets to investments in marketing technology. A high demand exists for digital marketing strategy talent with 36% of marketers highlighting strategic operations skills as a critical requirement for meeting goals. Unfortunately, 95% of respondents said the lack of available, qualified marketing professionals has negatively impacted their organization. Marketers turn to external service providers to meet one-third of their digital marketing talent requirements. Top strategic priorities include digital advertising and social marketing. For 2017, marketers selected digital advertising (49%), social marketing (45%), company website development (37%), content marketing (35%), email marketing (32%), search marketing (32%), and mobile marketing (27%). Facebook remains the preferred social media channel for 62% of marketers. Digital marketing is no longer a green field. Robust digital marketing services have taken root in organizations of all sizes. 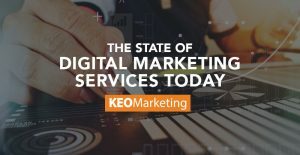 To learn more about how KEO Marketing can help your organization succeed in 2018 and beyond, or to request a complimentary marketing audit, contact us today.